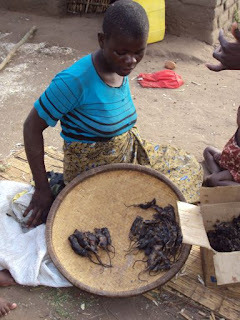 Mice are regarded as a very tasty dinner. They are cooked whole with the fur still on. I did not try them!!! 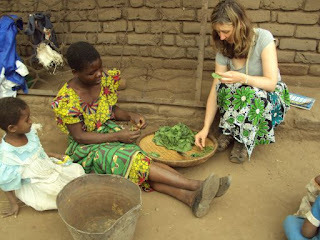 Me with my host mum and Tankia her daughter, preparing the dinner by stripping the stalks from pumpkin leaves. They are cooked to make a relish. Not very tasty! Pounding the rice in the garden. It was grown in the family's fields. The straw roof in the background was the toilet - a pit latrine. 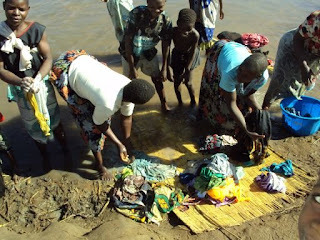 Women washing their clothes in the river. It was quite a walk from the village. Getting water from the bore-hole. 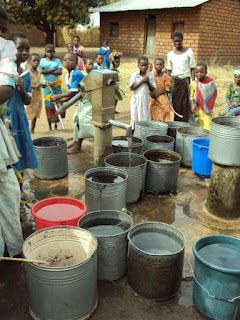 Before the village got a bore-hole, the water was collected from the river for cooking and washing. It was amazing to see the women carrying containers on their heads. I had a go and couldn't even lift the container off the ground! A lot of learning was done by rote - all the learners chanting together. Inside the classroom at Gosheni school. Only 2 classes were in roofed and completed buildings. One class met outdoors under a tree and one other was in an unfinished buildings like this one. The others had a roof but the walls were not completed. Home again! It is lovely to be able to use a toilet, to have a shower, to be able to see when it gets dark and to make a cup of tea when I want! Of course it is great to see the boys again. Duncan has overtaken me in height since I was away. The experience I have had has been once in a lifetime and I can’t even think where to start to describe it. Often time passed incredibly slowly, as I had nothing to do, especially at home. 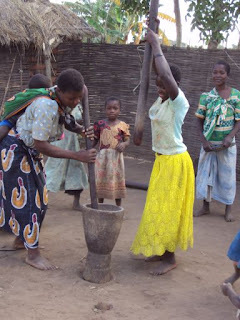 Highlights were things like doing my washing or helping to shell groundnuts or to prepare dried maize to make flour. The real lows were when things went wrong. The pit latrine at my home collapsed and I was left with only a bucket to use as a toilet for a week! Then there were the visitors to my room – first of all frogs, also huge beetles and finally the rats. That was enough for me to get out of village life 3 days before I was due to leave. Food was really difficult throughout too. I lived on carbohydrates almost entirely and had no dairy products or fruit for the whole time in the village except for a few bananas and a small orange when visiting someone for lunch. The school experience was incredible and I have learned so much from this in terms of my own professional ability. It is difficult to say how much of an impact my work will have but that is down to the school staff and the Educational Advisor to take things forward. The 3 In-service days we led were fantastic. I worked with 2 other Scottish teachers to deliver courses on Leadership and Management, Literacy and Numeracy, each lasting 5 hours. I hope I can share my photos and videos with you all and talk through some more of my personal experiences. Thank you all for your interest and support. I will try to post a link to some of my photos in the next few days. I picked up Val from Edinburgh Airport this morning. Flights were on time, no problems and she is quite tired. Val will do a final blog entry in the next few days and we will post a few photos. In pub and disco to end experience. Malawian gin rather good! See you soon. Off to lake for last day. Leave Monday 9am. Can you bring clean clothes and lead for camera? Said bye to school and family. Got drum from school. Sad to leave school. Tomorrow evaluation day. Great day - maths training! Did Maths Recovery stuff. Back to village tomorrow to say bye. Then final evaluation and fun weekend. Boat sounded fun! Woken by rats in middle of night. Had to get help! Seen three more this morning. Been taken back to town to say - feel like I haven't done it because of this but I couldn't bear it. In Service training went very well. I called her from the yacht when we were anchored Tuesday evening - she is doing very well and would have stayed on in the village but another teacher was insistent she should not stay with rats there. It is about an hour travelling to the village each way so not a big problem. Michael. Did not climb mountain. Town at 5,200m above sea level and altitude dizzy there. Another rat in room. Won't sleep! NOT COPING with that!! Apologies for delay in updating - I am now back on dry land. Back in village now. Brilliant weekend. Bought lots. Planned for next three days - five hours a day of In Service. Four schools in area. Tomorrow it is leadership. How I do five hours? Worried about rats but told its gone. Michael & boys have been away on a yacht for the last 2 days so he hasn't been able to publish Val's texts. She's fine and back at the village again. He will update blog when they get back on dry land tomorrow. Great day. Pizza and other fab food. Did plans and evaluations today because it was rainy, so tomorrow for trips. At lodge with teachers. Great to hear all stories. Have toilet and shower and electricity! Got chocolate cake. Rain today and cooler here. Off to buy pottery and possibly climb Dedza mountain. Tomorrow and Monday planning courses here. It is a RAT! Terrified. Saw it this morning. Off to Dedza to meet other teachers until Monday to plan InService courses for next week. Glad to get away from rat! Didn't sleep last night-noises in room. Need to see when back from school. At head teachers for lunch. I am coping well. Others not. Feel filthy - no wash this pm as out at Christine and back late. Really need wash - SO hot! 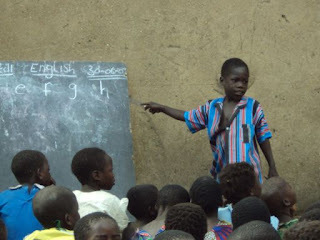 Been teaching 70 kids by myself in foreign language to them. Managed to share story and book, jungle animals and sing songs. On bike pm to visit Christine, she has toothache. Got phone top up. Not sure if you are getting all texts as I told you that already. One Global Teacher wants to go home, had enough. Good day apart from so hot and I forgot to take water to school. Had to cycle back in boiling heat. Held four new kittens. Lunch at a teachers today - got chips. Tried pawpaw - nice. Hope boys are good for granny and grandad. Plumber at house to fix broken toilet! Beyond repair so gets filled in and new hole dug. Then wall round it built, and old one knocked down. Sharpened pencils a.m. Teachers trying some of my ideas now. Big staff meeting planned for today but head teacher off with a cold. Kids running everywhere because not enough teachers - don't know why they just don't go home? Really starry night. I use a bike every day to school. Posh mountain bike! plus sometimes in afternoon too. Clouds but hot. Been sorting books, big pile for fire. School looking better. Teaching songs and rhymes. Been to visit nursery held in church by volunteer. Staff meeting on assessment to lead tomorrow - yuk! Glad I'm not in rain, wierd not knowing what you are up to! 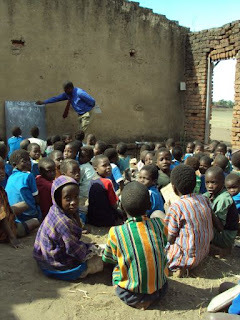 Been on trip to Lake Malawi with head teacher, Christine and her head teacher. Huge lake, lots of fish & boats. Great to get out. In old truck packed with people on roof! What we were told not to do! Hope boys feeling fine after ship journey. Say hi to all. Need top up for phone please. Very hot. Are you all packed? Boring day, sitting around watching world go by. Sunny though. Getting brown - face only. I tell the family and the school about the texts I get from you. Sitting in room eating chocolate! We leave for Shetland tonight, will still be able to receive texts and update the blog from there. Michael. Met 5 inch lizard in school loo. Loo at home collapsing around the hole - scared I fall down in dark! LINK happy with the work I am doing at the school. Been tidying up termite eaten books - filthy! Getting them organised. Off to do washing. Dodgy tummy - not good considering facilities! Sang Twinkle all pm yesterday with girl in family and friends!. I feel dirty all time- so dusty, clothes turn brown. Are boys excited about holiday? Remember to water plants. Remember phone + charger. At depute head for lunch. Got fried egg & chips!! Visited another Global Teacher Christine on bike pm. Visit tomorrow from LINK to check work I am doing. Colder day, need jumper. Can greet people in chichewa (local language) now. Missing you all lots too. Nearly two weeks past. 10 kilometres on bike today, very tired. Glad you had good time at swimming pool. Feel better now phone is working. No wild animals here. Had fone problems but seem to be okay again. Panicky at idea of no phone. Otherwise okay. Been playing parachute games at school and done work with class. A parachute was another of the things Val took out to give to the school. No texts were received yesterday. There seems to be a problem with her phone again. She has now managed to text her sister asking her to contact me and get me to call her. I spoke briefly to her this morning - she is fine, but the phone seems to be blocking any texts to my phone and it is telling her to call customer services for the Malawi phone company, but she can't get through to them.